Last week was a rather exasperating exercise in two-tiered markets; a type of divergence between the broad market and a handful of glamourous “concept” stocks that has often marked the wildest and most joyous points of reckless abandon in the market cycle, at least for speculators not tethered by traditional measures of value or historical experience. I’ll spare the list of names, which should be obvious to investors by their confetti. Near the end of speculative runs, the market’s most glamourous concept stocks often carry significant market capitalizations, and therefore drive movements in the capitalization-weighted indices without broad participation from the rank-and-file. In the short-term, that can be uncomfortable for hedged-equity strategies that are long a broad portfolio of value-oriented stocks and hedged with an offsetting short position in the major indices. Even if the cap-weighted indices outperform the portfolio of individual stocks by a few percent, that difference shows up as a loss of a few percent in the overall hedged position. It’s easier to be patient when one recognizes that these episodes are temporary, and typically represent a significant red flag for the equity market. A progressive internal deterioration of the market has been increasingly evident in recent months, and became severe last week. For example, the chart below compares the S&P 500 Index to the same 500 component stocks, but weighted equally rather than by market capitalization. While the difference may not seem significant, it also implies that even an equally-weighted portfolio of S&P 500 stocks, hedged with the S&P 500 index itself, would have lost several percent since mid-April. 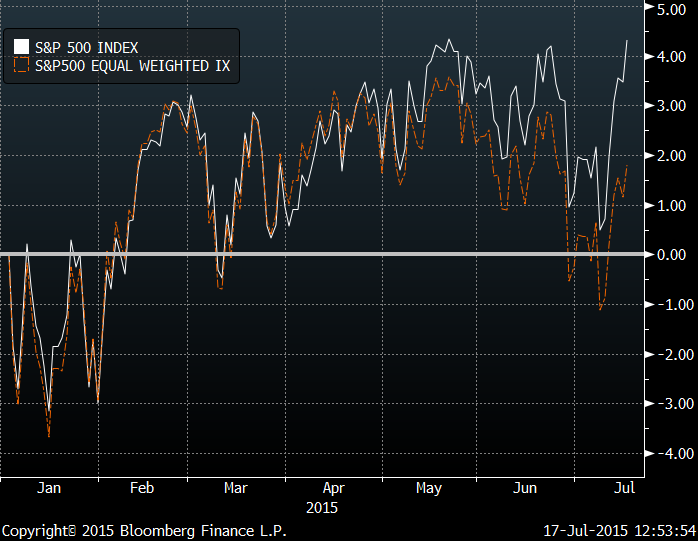 The same observation holds for the Nasdaq index. 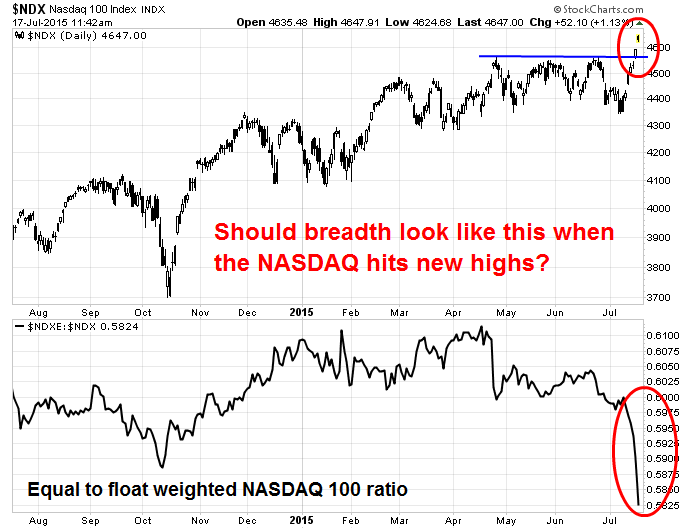 The chart below is from analyst Cam Hui, showing the Nasdaq 100 Index along with the ratio of the equal-weighted index to the float-weighted index. What’s going on is that a handful of very, very large cap stocks account for an increasing share of the net gain, while the rank-and-file have been largely stagnant or in retreat. Other measures of market participation have been equally problematic. 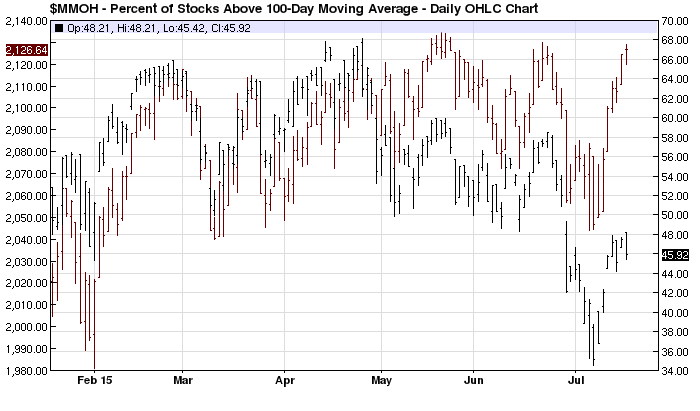 The chart below compares the S&P 500 Index (upper red bars, left scale) with the percentage of stocks trading above their 100-day moving average (lower black bars, right scale). Fewer than half of all U.S. stocks remain above their 100-day moving averages, and only about half are above their 200-day averages. As I’ve emphasized nearly every week since mid-2014 (when we completed the awkward transition from our pre-2009 methods to our present methods of classifying market return/risk profiles – see A Better Lesson Than “This Time is Different” and Voting Machine, Weighing Machine for the full narrative), the central lesson of market cycles across history, and even the most recent full cycle since 2007, is that the behavior of market internals is central to distinguishing an overvalued market that collapses from an overvalued market that continues to advance. Importantly, market outcomes in response to Federal Reserve easing are also dependent on the behavior of market internals. When market internals have deteriorated following extreme overvalued, overbought, overbullish conditions, even Federal Reserve easing has not reliably supported the stock market. We’re certainly open to the possibility that the market could recruit more favorable uniformity, and thereby signal a more robust willingness of investors to speculate. That wouldn’t make valuations any less obscene, but it would defer our immediate concerns about severe market losses. Still, the central feature to watch in that regard is market behavior across a wide range of individual securities, industries, sectors, and security types – not simply central bank behavior. As a reminder of how all this works, it may be helpful to recall how this same situation (which we’ve previously described in real-time with the same concerns) has played out historically. Recall that our measures of market internals shifted negative in October 2000, following what was until that point a reserved but still constructive stance. Once that period of persistent overvalued, overbought, overbullish conditions was joined by a breakdown in market internals, all bets were off, even bets that might rely on the Federal Reserve. “To illustrate the probable epilogue to the current bubble, we've calculated price targets for some of the glamour techs, based on current revenues per share, multiplied by the median price/revenue ratio over the bull market period 1991-1999. Alan Abelson kindly featured those comments in Barron’s Magazine, followed that Monday morning by a round of dismissive remarks by several CNBC anchors. No matter – those projections turned out to be optimistic. As it happened, the 2002 lows for these “four horsemen of the internet” took Cisco to $8.60, Sun to $2.42, EMC to $3.83, and Oracle to $7.32. We forget that the most popular large-cap speculative leaders at the 2000 peak lost 92% of their value over the completion of the cycle. It feels better to forget. Despite extreme losses in the glamour stocks that comprised the prevailing “concept” in prior episodes of speculative overvaluation, the character of those stocks has often varied. In the advance leading to the 1929 peak, the darlings included AT&T, Bethlehem Steel, General Electric, Montgomery Ward, National Cash Register, and Radio Corporation of America – companies that embraced the expanding world of department stores, communication, and industry. Those stocks would lose an average of 93% of their value by 1932. Today, the focus is squarely on companies that have enjoyed striking “network effects” – where users are drawn to a given company largely because other uses are already there. While these network effects have generated enormous revenues, today’s glamour stocks also trade at earnings and price/revenue multiples that have historically been reserved for companies at a much earlier point in their growth trajectories, not for mature companies with already overwhelming market share. As was the case during the tech bubble and the housing bubble, disagreement is what makes markets, and we respect that others have different views. From a historical standpoint, however, when the equity market has joined persistent overvalued, overbought, overbullish extremes with deteriorating market internals, with a cherry on top featuring two-tiered speculation in glamour stocks and heavy new issuance of stock by companies that predominantly have no earnings, we find it difficult to find any precedent that hasn’t worked out quite badly. We’re open to an improvement in market internals that might defer our concerns, but the financial markets simply have never enjoyed hypervalued speculative advances without those speculative gains being completely transitory over the completion of the market cycle. In short, recent market action has featured a two-tiered market in large-capitalization glamour stocks that we’ve seen before at speculative extremes throughout history. This is uncomfortable for hedged-equity in the short-run, because the glamour stocks drive gains in the major indices that aren’t sufficiently matched by gains in broadly constructed stock portfolios – particularly those following value-conscious strategies. It’s helpful to recognize that action for what it is, and for what – historically – has typically followed. None of that means that the discomfort won’t continue for a while longer, but history teaches that it’s an awful idea to try to “play” the mature phase of a speculative trend, especially once market internals have already given way. In our view, the current market environment begs for investors to honestly assess their tolerance for loss, to align the duration of their investment portfolio with the horizon over which they expect to spend their assets; to consider their tolerance for missing returns should even this obscenely overvalued market continue to advance for a while; to understand historical precedents; to consider whether they care about such precedents; and to decide the extent to which they truly believe this time is different. There can be all sorts of answers to those questions, and we’ll pursue our discipline on behalf of those who share our full-cycle perspective, but every investor should ask those questions seriously. Meanwhile, it’s important to understand how risk and return work over the course of the market cycle, and in particular, the effect that compounding has on both returns and losses. The following are some considerations that may be helpful in thinking about these issues. First, remember that the typical, run-of-the-mill decline that completes a market cycle also typically wipes out more than half of the preceding bull market advance. This can be demonstrated in cycle after cycle across history. In recent cycles, because of relatively higher valuations at the market peak, the completion of the market cycle has wiped out years of prior market gains. We can’t emphasize often enough that the 2000-2002 market loss wiped out the entire total return of the S&P 500 – in excess of Treasury bills – all the way back to May 1996, and that the 2007-2009 loss wiped out the entire excess return of the S&P 500 back to June 1995. Even at present market extremes, it would require only a historically modest 30% market retreat to wipe out the entire total return that the S&P 500 has achieved in excess of risk-free Treasury bills over the past 15 years. Extreme valuations may not always have near-term consequences, but the long-term consequences are profound. Our actual expectation is that the completion of the current market cycle is likely to wipe out the entire total return of the S&P 500 – in excess of Treasury bill returns – all the way back to roughly October 1997; an outcome that would require a market retreat no larger than it experienced in the past two cycles, and that would not even carry historically reliable valuation measures to materially undervalued levels (see When You Look Back On This Moment In History). Then again, a sustained period of suppressed interest rates is only likely in a continued environment of restrained nominal economic growth. 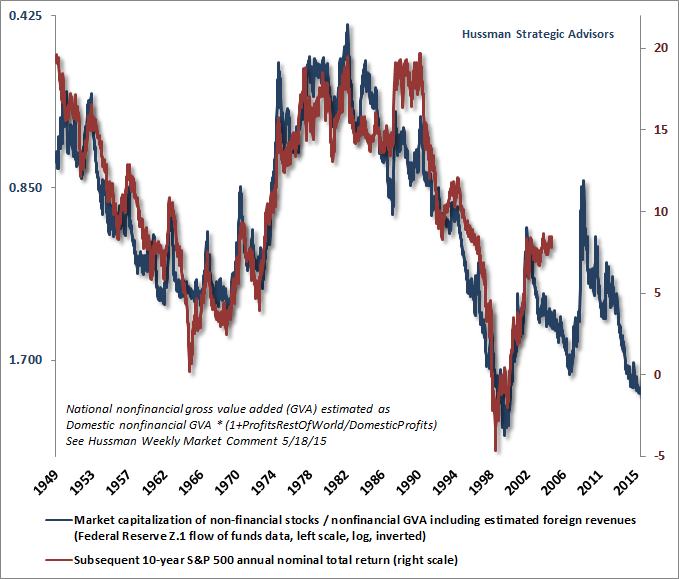 Historically, those interest rate and nominal growth effects have largely offset, which is why Market Cap/GVA has been reliably correlated with actual 10-year S&P 500 nominal total returns regardless of the prevailing level of interest rates. Indeed, the only reason that correlation isn’t 100% is that the only way to establish extreme overvaluation or undervaluation is for the market to overshoot or undershoot the return one would have expected a decade earlier (see What Does That Difference Mean?). So for example, the overshoot of actual 10-year market returns in the decade following 1987-1990 corresponds to the extreme overvaluation of 1997-2000. Similarly, the overshoot of actual 10-year market returns in the decade following 2002-2005 corresponds to the extreme valuation of 2012-2015. Presently, we anticipate negative total returns for the S&P 500 Index over the coming decade. Even if valuations remain above historical norms a decade from today, it will be extremely difficult for stocks to post total returns beyond the low single digits in the coming 10-year period. Next, a few facts regarding compounding may be useful. Recognize, for example, that a 30% market loss turns a 135% gain into a 65% gain. While there’s a great deal of variation across individual market cycles, that’s roughly the historical average for a 5.25 year market cycle: a 135% gain, a 30% loss, and a 65% full-cycle return (about 10% compounded annually, with the full-cycle return coming in at less than half of the bull market gain). The recent market cycle has extended much further, but it has also brought the most historically reliable measures of valuation to obscene levels. Similarly, a 50% market loss converts a 200% market gain into a 50% market gain. That may seem odd, but that’s just how compounding works, and it’s roughly how we expect the present cycle to be completed. On the subject of relative performance of defensive strategies, the effects of compounding get particularly interesting. For example, starting with the same investment in each of two strategies, if strategy A loses 33% and strategy B gains 33% in the same period, strategy B will have doubled relative to strategy A; that is, the value of B will become twice that of A. If strategy A loses 50% and strategy B gains 50% in the same period, strategy B will have tripled relative to strategy A. That profound impact of opposing movements is why hedged and alternative investment strategies should always be evaluated over complete market cycles, rather than the advancing or declining portion alone. 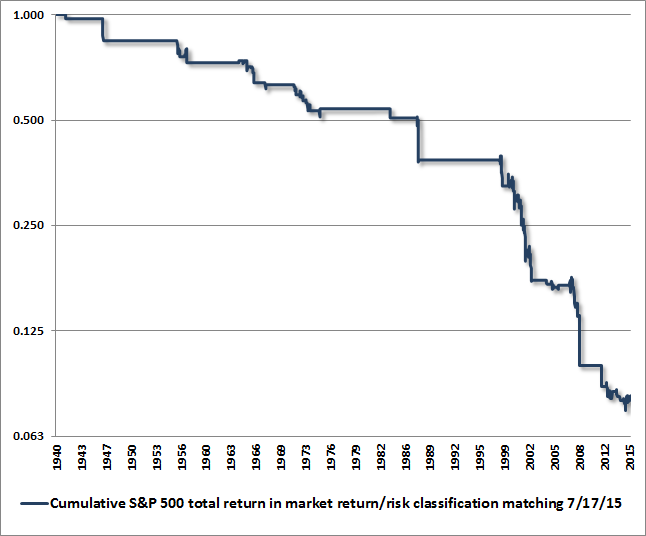 To bring the current situation up to date, the chart below shows the cumulative total return of the S&P 500 Index, restricted to the 8% of history that matches the prospective market return/risk classification that we presently identify. Holding the S&P 500 during that small subset of periods would have gradually turned an initial dollar into roughly 7 cents. Conversely, the other 92% of historical periods actually capture about (1/.07 =) 14 times the cumulative total return of the S&P 500 index itself. Clearly, we take these conditions seriously. While we’ve observed some sideways choppiness in recent months, rather than a fresh line down, that choppiness is consistent with what we’ve observed near other cycle extremes including 2000 and 2007. Suffice it to say that an improvement in market internals and credit spreads would significantly ease our concerns about immediate downside risks, and we’ll take that evidence as it arrives. We’re sometimes asked how much hedging “costs,” but that’s a somewhat loaded question. If hedges are established with enough selectivity, they shouldn’t “cost” anything – rather, they should positively contribute to total returns over time. That was certainly our experience prior to 2009, and it’s certainly our objective in the future, given the adaptations we introduced in mid-2014. The benefit and cost of hedging with a "flat" short position in a given market index is straightforward: if the market declines, the short position offsets the impact of the market loss on the portfolio; if the market gains, the short position surrenders the impact of the market gain. Clearly, one wishes to avoid such hedges in market conditions associated with significant expected market returns and relatively muted risk of market losses. While it's not well-appreciated here, our present methods are associated with a fully unhedged outlook in more than 60% of periods across history, typically encouraging the use of leverage. 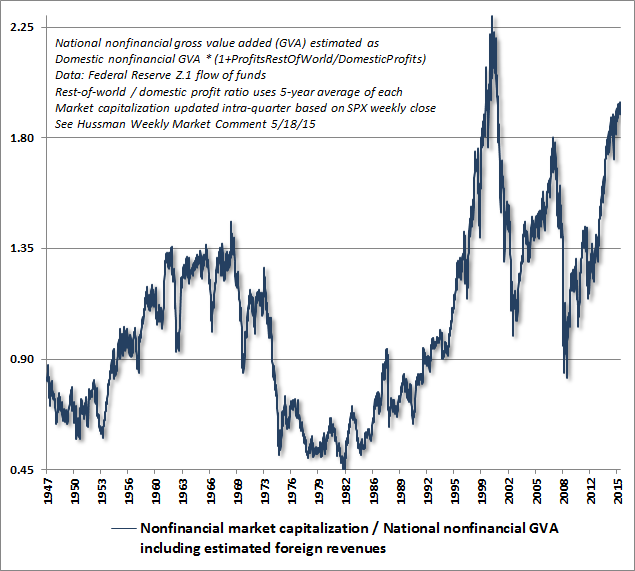 Nearly all of those periods are characterized by favorable valuations, favorable market internals or both. It's equally unappreciated that I advocated just that outlook for years during the 1990's bull market advance (though not during the later bubble phase). The remaining 40% of periods that our methods classify with flat or negative market return/risk profiles are associated with a massive 93% cumulative market loss. Nearly all of that net loss occurred in the 8% of history that matches the market return/risk classification we presently identify. Of course, one can also establish a hedge that has option-like characteristics. To estimate the potential impact of a put option covering notional value (which currently would represent one S&P 500 index put for a $212,664 portfolio), I’ve estimated the value of S&P 500 index put options back to 1940 using the Black-Scholes model, imputing volatility prior to the 1980’s based on the post-1980 relationship between the CBOE volatility index (VIX) and the volatility, absolute, and directional change in the S&P 500 at each point in time. The resulting figures are estimates, and do not depict an actual portfolio. The chart shows the estimated cumulative impact of an at-the-money S&P 500 index put option under various market return/risk classifications we identify. Both of the hedging criteria below essentially capture periods characterized by overvalued, overbought, overbullish extremes, but the blue line imposes an additional restriction that market internals or credit spreads must also be unfavorable. 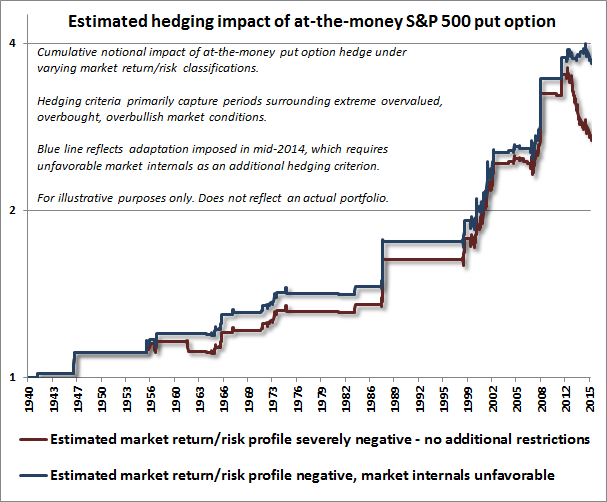 Notably, that blue line reflects the estimated cumulative impact of an at-the-money put option hedge in the 8% of historical periods that match the market return/risk classification we presently identify. The striking difference between the red line and the blue line above illustrates the multi-year challenge that we resolved last year. In prior market cycles across history, the emergence of an extreme syndrome of overvalued, overbought, overbullish conditions was typically followed quickly by deterioration in market internals and subsequent losses in major indices. As a result, it was reasonable to respond directly to those syndromes by immediately establishing a strongly defensive outlook. The primary effect of the Federal Reserve’s policy of quantitative easing in recent years was to disrupt that sequence by intentionally encouraging continued yield-seeking speculation despite persistent overvalued, overbought, overbullish conditions. In the absence of additional restrictions, aligning a hedge with the estimated market return/risk profile resulted in persistent option time-decay, as illustrated by the red line, making put option hedges costly instead of beneficial. The blue line illustrates the effect of imposing an additional overlay that requires actual deterioration in market internals or credit spreads as a prerequisite for taking a hard-defensive outlook. We imposed that overlay on our own methods in mid-2014. All of this may provide a better understanding of why we encourage a hard-defensive outlook in the current market environment. Historically, accepting market risk in the 8% of history matching the present market return/risk classification has turned a dollar into about 7 cents over time. The corollary is that the remaining 92% of history has captured about 14 times the cumulative return of the passive index itself. Our estimate is that structuring a hedged position to have option-like characteristics could historically have multiplied that outcome several times over. Again, these figures are estimated from historical data and do not reflect an actual portfolio, nor do they ensure that future outcomes will be similar to those presented here. Still, my hope is that they contribute to an understanding of why we take current market conditions so seriously, and why we encourage such a defensive response, given historical precedents. In our view, index put options can be enormously useful in periods where the expected market return/risk profile is severely negative. Of course, the ideal is to avoid the “slow bleed” of option time decay as much as possible, by taking a highly defensive investment stance only in situations associated with significantly negative market outcomes. That’s really where we expect the adaptations we introduced in mid-2014 will have their greatest impact over the completion of the present market cycle, and in future ones. Last week, the ratio of spot gold to the Philadelphia Gold and Silver Index (XAU) spiked to about 20.8, a level that is by far the highest extreme in history. Moreover, core inflation moved ahead of its level of 6 months ago, and leading economic measures continued to slip (though we don’t see them as being indicative of recession risk at present). It’s reasonable to view part of the weakness in gold stock prices as being the result of spot gold falling close to its marginal production cost (which has gradually escalated over the past 15 years). So there are certainly near-term earnings concerns for gold stocks here. But marginal production cost has historically provided a good support level for spot gold, and we would expect any increase in gold prices to quickly ease earnings concerns for these stocks. Overall, we don’t endorse an aggressive outlook on gold stocks, but we did become more constructive last week, and we do believe that the current extreme is notable. Trend-following methods don’t perform terribly well with this group, and the equities are quite volatile, so investors should be very aware of their own risk tolerance. While the marginal production cost issue undoubtedly makes the current extreme in the gold/XAU ratio less compelling than it might appear otherwise, we do believe that precious metals shares are quite depressed in valuation terms. 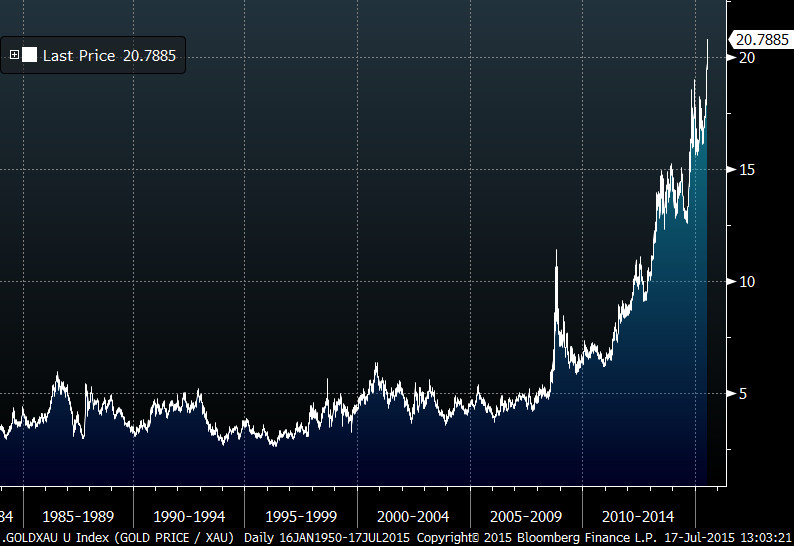 The chart below shows the ratio of spot gold prices to the XAU. Shareholder Note: New Fund Notes and Commentary have been posted, discussing the current investment stance of the Hussman Funds.